"Et introibo ad altare Dei: ad Deum qui laetificat juventutem meam." It means: "And I will go in to the altar of God: to God who gives joy to my youth." The priest and the server say that three times, tossing it back and forth and interspersing it with other prayers, before beginning mass. They are part of the Prayers at the Foot of the Altar. Which, if you just walked in and didn't know what was going on, you would think we were nuts. The priest and the altar servers are up in the front, facing the altar, the servers are on their knees with their heads on the ground, and you cannot hear what they are saying. And the rest of us are kneeling, doing nothing. Incense is rising and candles are burning. Most mysterious! "Confitebor tibi in cithara, Deus, Deus meus: quare tristis es anima mea, et quare conturbas me?" "To thee, O God, my God, I will give praise upon the harp; why art thou sad, O my soul, and why dost thou disquiet me?" Isn't that beautiful? I think those lines come from ancient Hebrew psalms. That is my guess. Howard says Catholicism seems to him like Judaism taken to the next level. That is an interesting way of looking at it. Howard and I went to the Buffalo Club lastnight for this cocktail party held by the Irish Classical Theatre's James Joyce Circle. God knows how we ended up on their guest list, but we did, and we went. We didn't stay long, though, because No. 1 we didn't know anyone, and No. 2 I have been fighting off this bug all week so I was a little out of it. I have been keeping this bug at bay with Zicam. It has been working but barely. No. 3 to my great disappointment no one got up and started reciting any Joyce. You would think when the James Joyce Circle gathered, someone would do a little bit from "Portrait of the Artist as a Young Man." Or "The Dead." Well, wouldn't you? What about the Grateful Dead? Weren't we just talking about "The Dead" yesterday? 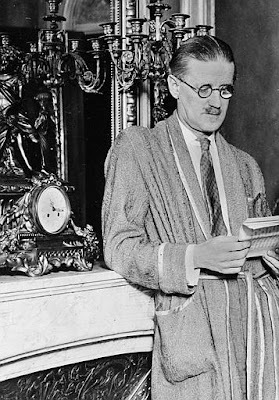 All of a sudden my life is all about James Joyce. I wonder what that means. That is James Joyce in the picture up above, by the way. He looks as if he is at the Buffalo Club! The up side of our early departure from the James Joyce Circle was that we got to go to my friend Gary's house, where we took turns playing his baby grand piano. I did some Chopin and Brahms and got through it. Those were the wages of having had only one glass of wine at the meeting of the James Joyce Circle. Howard played "The Blue Room." And lounge sensation Guy Boleri played songs from "The Music Man" and "My Fair Lady" and we all got to sing along. The impromptu glee club included Howard, me, Gary and Gary's neighbor Herb. 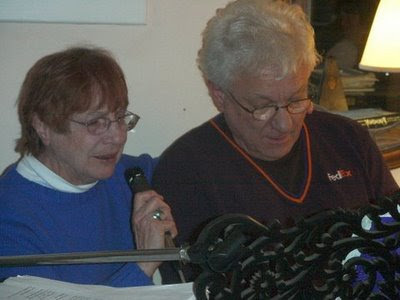 Here is a famous picture of Guy at my piano with Peggy Farrell. I have been hearing this week from people who knew Leonard Pennario that Pennario used to do what Guy was doing lastnight: play all night for them at parties, and let them sing along. I think that is a wonderful way to be. And there are not many concert pianists who are like that, I am sure of that. "Now the big finish!" Guy yelled as we lurched into the final chorus of "On the Street Where You Live." It was not pretty to hear! I am surprised that the people on LaSalle Avenue, which is the street where Gary lives, did not march on the house in protest. No wonder this morning I needed my dose of holiness. According to a Joyce authority, Groucho Marx turned up as a verb in Finnegan's Wake ("grouching"). When informed of it, Mr. Marx responded "Well, let Joyce be unconfined." Your party experience reminds me of the party scene in "The Ugly", Anne Pigone's take off on 'The Dead' where the Cristmas diner has turned into a wedding reception.